Buy local and organic bouquets. Supporting local farmers who grow organic flowers encourages others to convert to organic practices and reduces the amounts of toxic chemicals used on farms. Toxic chemicals used on flower farms can place animals in danger, poisoning the water and soil and endangering the lives of birds, bees, earthworms, moles and rabbits. If you like in New York, San Francisco, New Orleans or Los Angeles, you can get beautiful, organic and local bouquets from Good Eggs! Alternatively, pick flowers from your yard and make your own bouquet. Choose vegan sweets and chocolates. 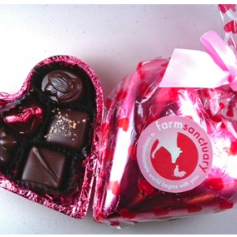 Most chocolates sold through mainstream businesses are made with ingredients that have come from industrial farms who treat their animals terribly. These farms care very little for the well-being of the cows and goats that give them their milk, or the chickens that give them their eggs. One person on a vegan diet can save one hundred animals a year, so why not make some changes? Sjaak's Organic Chocolates choose fair trade practices and use organic ingredients. Their vegan "milk" chocolate supports Farm Sanctuary and tastes just as good for vegans as it does for non-vegans! Celebrate with wine that supports a good cause. Benefit Wines allows you to shop for wines by charity, state, or cause. They give a portion of all sales to different charities, from pet and wildlife organizations, to health based organizations, veterans organizations and community organizations. You can support any cause that's close to your heart. 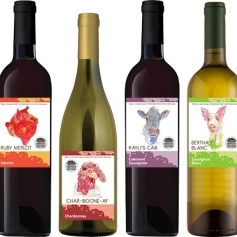 We love the sample pack of wines presented by the Woodstock Farm Animal Sanctuary. $23 of the purchase price is donated to the sanctuary. Small gifts are sometimes better than big. This is especially true when the small gift is thoughtful, serves a purpose, and doubles as a gift that gives back! 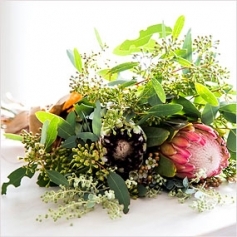 The perfect bouquet of organic flowers in a beautiful vase. The tasties glass of charitable wine in a brand new wine bucket, or partnered with a sweet cork! 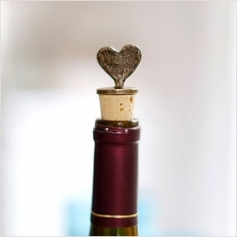 This heart shaped cork from The Little Market is handmade by the artisans working for Roots of Creation, a fair trade company in Cape Town, South Africa. Find the perfect e-card. If everyone chose to send a card through email rather than printed paper, we could save hundreds of trees, give animals their home back, and provide ourselves with more clean oxygen. Companies that provide e-cards reduce paper waste and their own carbon footprint. Many charitable organizations now offer e-cards as a fundraising option. The World Wildlife Fund offers Valentine's Day e-cards that are environmentally friendly and offer the chance to give a charitable gift donation. These Valentine's Day e-cards from The Nature Conservancy also give the chance to give back while supporting the organization as it continue its mission to protect lands and water. If you're thinking that Valentine's Day is the perfect time to add to your family, please be wise, think before you act and, if you know you're ready, adopt! Animals are not disposable and require a lot of love and attention. They cannot be repackaged or regifted, and it would be so sad if they had to be returned. A suprise animal may not be the best gift. Instead, choose to take a romantic trip to the shelter and mull the decision over together. Be sure you are ready for the commitment and have enough love to go around. Bringing an animal into your family can be the best decision you ever make but it must be done with thought.